We know that your company isn't exactly like everyone elses, so we don't want to shoehorn your way of working. We don't rely on others' plug-ins to make some custom feature on your website, so we know it'll continue working long into the future. Lastly, we build with the future in mind, if you think up some amazing new thing you site should do, we can build it in. We are specialists in Content Managed Websites that allow your team to update your website quickly, easily and often. Our bespoke Content Management Systems (CMS) are the result of 15 years of experience. We're always striving to make our websites more powerful and easy to use. The possibilities are endless. We will build you a website you can update yourself, which will reduce the time you spend on maintenance and avoid having to pay for small changes in the future. Our code is written from scratch to strict industry standards and we pride ourselves on the high quality of work we produce. With a bespoke CMS, not only will you be able to update your website's content, but you will also be able to edit page meta data specifically for search engine optimisation (SEO), as well as simple installation of analytics software, giving you total control of your online marketing strategy. A content management system, often abbreviated to CMS, provides an interface for editing content on a website. It allows users to easily edit copy, images and more without needing to know how to code. We have been creating websites powered by handwritten CMSs for more than 10 years, and believe they offer a far better and refined experience than an off the shelf product. What’s more, because we build so many content managed websites and get great feedback from our clients, it gives us insight and helps us create and develop new features that make the job even easier for our users. 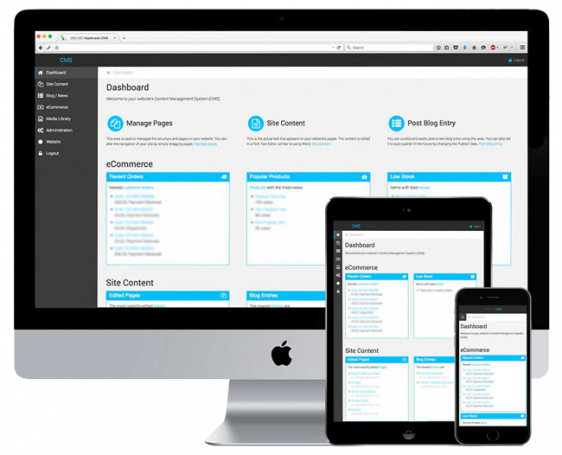 A CMS gives you complete control over the structure of your website. No need to pay extra to add, edit or remove pages, or change the navigation headings. We will set you up for independence. You can use the CMS to embed images, videos and other downloadable content. Your CMS will take care of single and bulk uploads. All imagery and videos will automatically be resized to suit the front end design and galleries, making things nice and easy. Your CMS will make editing copy simple with a Rich Text Editor (RTE). You won’t need to know how to change HTML code to edit the appearance of paragraphs or headings. It’s simple to create bold or underlined text, to change the character size, and to add links within your text. A CMS comes into its own when you need to update news or blog articles. Too often sites are updated with enthusiasm when a website is new, but the frequency of new posts dwindles with time. Making the process of adding content as simple and as streamlined as possible will enable timely and consistent updates. A CMS can adapt to multiple different users, with set roles and permissions. Some clients prefer, for example, to have one member of their team who can only edit their blog, and other users who can only access customer orders for handling, and administrators to edit the integral structure of their websites. We don't use off-the-shelf solutions. We believe that our clients deserve a website built for them, not just 'downloaded'. This means that we can build anything. For instance, a single content management system that controls three unique websites. Using one log-in and password, all three websites can be updated quickly and easily.